low-income individuals in each of California's 58 counties. CalFresh utilization, lost federal benefits, and lost economic activity (Lost Dollars, Empty Plates) by county. Tables showing the PAI for all California counties are available below. Each year, the United States Department of Agriculture (USDA) produces an annual state-level PAI. The PAI provided on this page is a county-level analysis modeled on the USDA methodology. The PAI estimates CalFresh utilization among individuals who meet select CalFresh eligibility criteria. More specifically, the PAI compares two populations: (1) CalFresh participants and (2) the number of individuals with incomes below 125 percent of the federal poverty threshold1 who do not participate in the Food Distribution Program on Indian Reservations (FDPIR)2 or receive Supplemental Security Income (SSI) if those individuals have income below 125 percent of the federal poverty threshold 3. Because the PAI incorporates three select eligibility criteria, it is not a measure of CalFresh participation among fully eligible individuals. The county-level PAI is one indicator of how well counties reach individuals with CalFresh. On its own, the PAI is not a comprehensive tool for evaluating counties' administration of CalFresh. Advocates and administrators should work to establish the use of additional indicators in assessing CalFresh administrative performance. Methodological approaches may change over time, altering the comparability of PAI estimates calculated before and after each change. For example, CFPA's 2014 PAI incorporates county-specific estimates of SSI recipients with incomes below 125% of the federal poverty threshold. CFPA's 2012 PAI employed a different methodology, subtracting all SSI recipients from the PAI denominator. Income data from the American Community Survey are used to calculate the PAI. These data have a given level of precision expressed as a margin of error. Margins of error can make it difficult to distinguish true trends from variations inherent to the methods used for collecting and analyzing survey data. Each year, USDA releases SNAP/CalFresh participation rates for all 50 states and the District of Columbia. These participation rates are complex estimates of SNAP/CalFresh utilization among eligible individuals. The rates take into account several factors affecting SNAP/CalFresh eligibility and utilization. In comparison, the PAI takes into account three CalFresh eligibility criteria: income, FDPIR participation, and SSI status. State participation rates for any given year are typically released two years following. In comparison, the PAI can be calculated within one year. USDA state participation rates may be the best available estimates of CalFresh utilization among eligible individuals. However, the rates are calculated as statewide measures and have limited relevance at the county level, particularly in a state as diverse as California. USDA does not calculate county-level participation rates. Because CalFresh policies and practices vary across California counties, county-level indicators of utilization and administrative performance are necessary. The PAI is one such indicator. 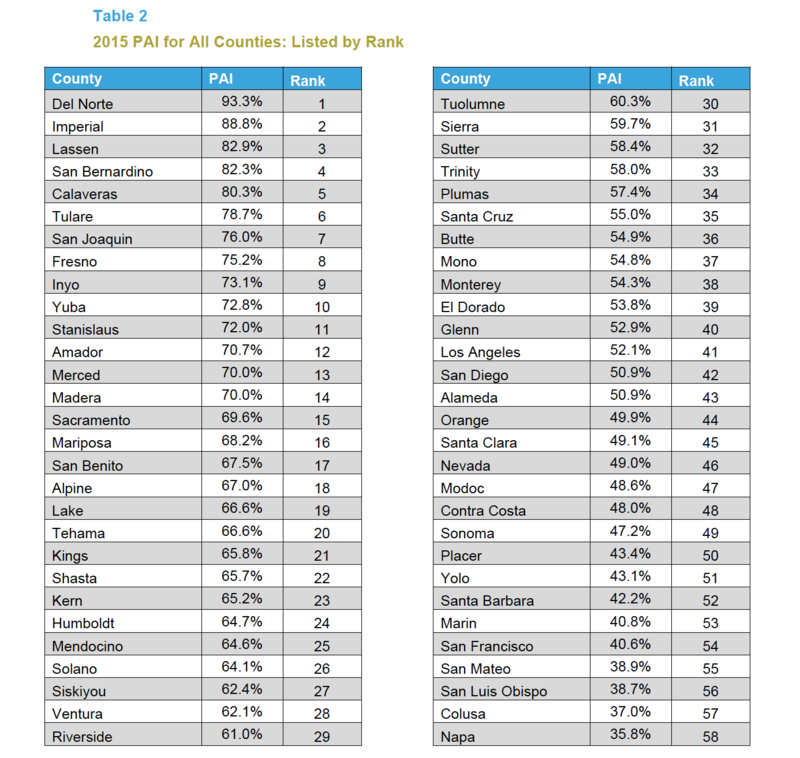 The tables below show the PAI for all 58 California counties and include county rankings. 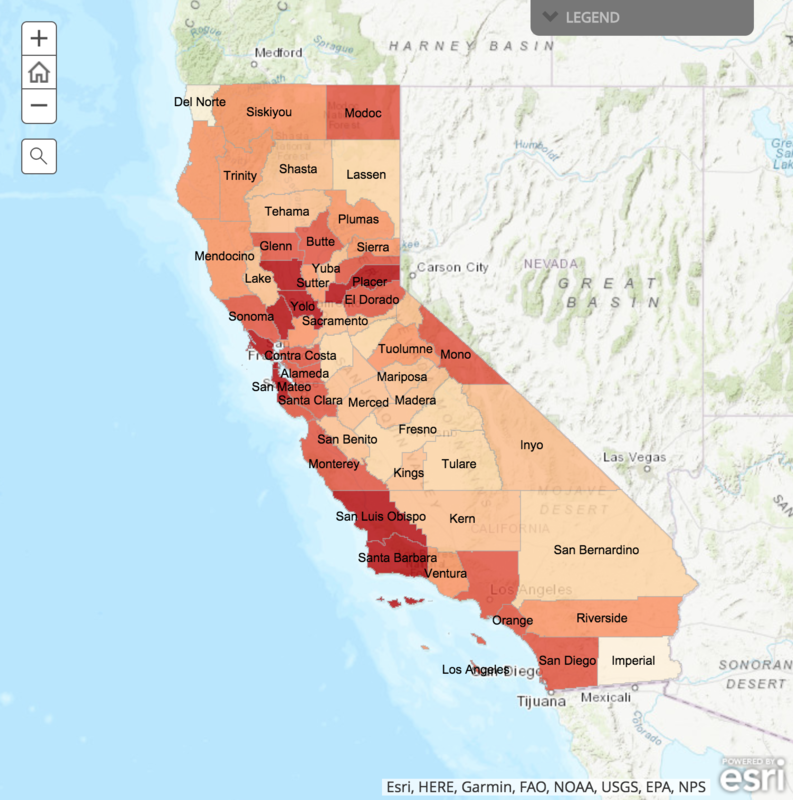 The number-one-ranked county has the highest CalFresh utilization relative to the total number individuals with incomes below 125 percent of poverty who do not participate in FDPIR or receive SSI.4 When applied to statewide data, the methodology used to generate Tables 1 and 2 yields a PAI of 0.580 for California. Table 1 lists the counties alphabetically. 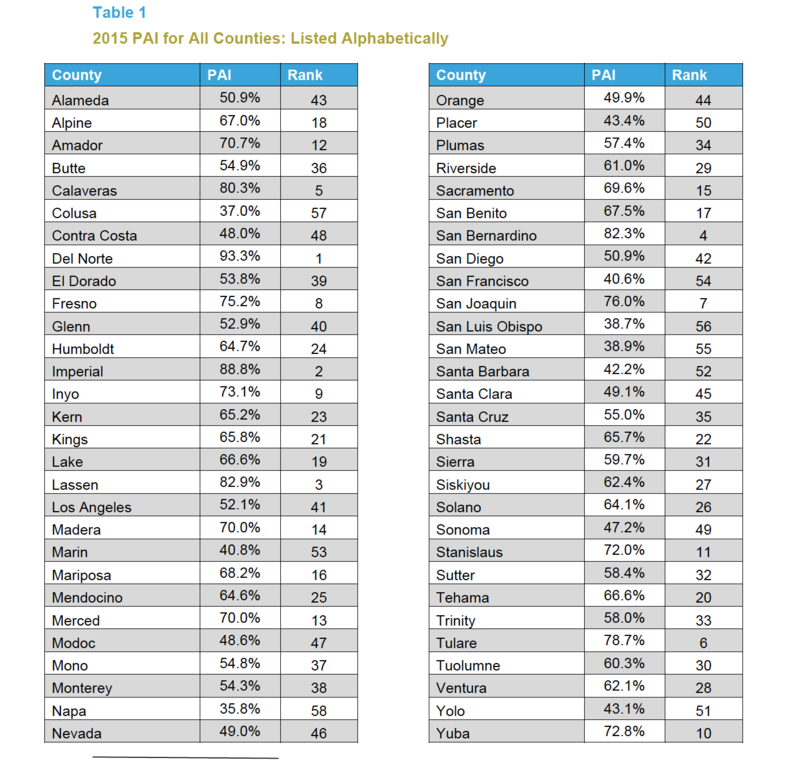 Table 2 lists the counties by PAI rank. Table notes 1-2: The PAI is listed here with three significant digits. However, the PAI used to calculate the county ranking contained 15 significant digits. Viewed with four significant digits, Merced County’s PAI is 0.6999 and Madera County's PAI is 0.6997. Thus, their respective ranks are 13 and 14. Similarly, Lake County’s PAI is 0.6665 and Tehama County’s PAI is 0.6657. 1 Until July 1, 2014 eligibility criteria for CalFresh allowed participants to have incomes up to 130 percent of the federal poverty guidelines (FPG). The 2014-15 State Budget included a provision to increase the gross income limit to 200% of the FPL for the TANF-funded service that confers categorical eligibility for all CalFresh households. Practically speaking, this change raised the CalFresh gross income limit from 130% FPL to 200% FPL. The net income limit of 100% still applies, except for households containing a senior or disabled member. (For more information on the opportunity to boost enrollment through modified categorical eligibility and the new gross income test, read our analysis.) The 2015 PAI still utilizes the 130% FPL test. However, annual county-level estimates are not available for the number of individuals with incomes below 130 percent of FPG. Therefore, having an income below 125 percent of the federal poverty threshold is used as a proxy for CalFresh income eligibility. The use of this proxy may underestimate the number of individuals who are income-eligible for CalFresh. 2 FDPIR participants are not eligible for CalFresh. 3 In California, SSI recipients are not eligible for CalFresh/SNAP, though that state policy will change in summer 2019. 4 For Tables 1 and 2, Supplemental Security Income (SSI) participants with income below 125 percent of poverty are subtracted from the population of individuals who are income-eligible for CalFresh. Previous versions of CFPA's PAI report have subtracted all SSI recipients from the population of individuals who are income-eligible for CalFresh.